Davitt Photo Centre opened it doors in April 2003. Providing a professional developing and printing service for professional photographers, keen amateur and the general public. Since opening it’s doors Davitt Photo Centre has become one of the West’s leading Professional Photographic Labs. Davitt Photo Centre is run by husband and wife team Martin and Debbie, who have a combined experience of 40 years in the photographic business. 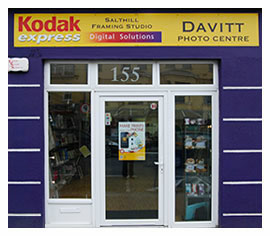 Davitt Photo Centre is situated on the main thoroughfare of Salthill, opposite the local Church. We offer a wide range of services including digital photo prints, film developing, scanning and much more. We also have a framing studio on the premises offering a wide selection of frames. Most of the Photos taken now are taken on smart phones, unfortunately a lot of people don’t realise how easy it is to print these precious photos. Our new website makes it easy to order prints, enlargements, canvases and gifts from your smart phone. Or if you need help why not call into our shop in Salthill where we will only be too happy to assist you get those precious memories printed into long lasting photos just in case your phone gets damaged or stolen or dropped in the loo and your precious memories are lost forever.